After receiving several requests to make Naked Eggs and Flying Potatoes available as an ebook on Kindle and Nook, we are happy to announce that it is now available on both platforms. Keep in mind that this is not the enhanced book that you can get through the iTunes store. An ebook is a simple conversion of the written word and pictures to a generic electronic reader like Kindle or Nook. You will still get all of the experiments, step by step instructions and explanations from the printed book. The enhanced book includes over 200 photos and 37 videos to see the WOW factor behind each experiment. It is only available for iPad, iPhone and iTouch. This is not your ordinary book of science experiments. 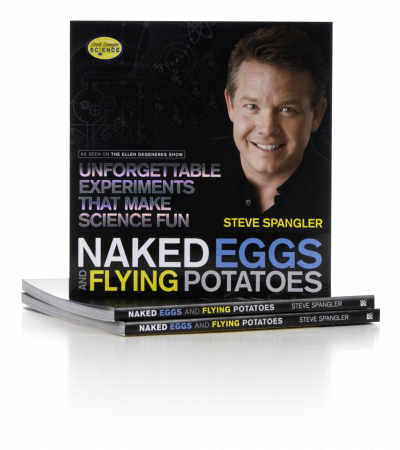 Naked Eggs and Flying Potatoes is a geek-chic look at Steve Spangler’s latest collection of tricks and try-it-at-home activities that reveal the secrets of science in unexpected ways. What makes this book different from other science experiment books is the amazing photography. Over 200 color photographs and 37 videos accompany the step-by-step instructions and simple explanations to uncover the how-to and why for each activity. Make potatoes fly, cornstarch turn into quicksand, and 2-liter bottles of soda explode on command. I’m courious about the “Over 200 color photographs and 37 videos accompany the step-by-step instructions and simple explanations to uncover the how-to and why for each activity.” How are they accessed via the kindle.